Trekking at Mt. Sentoboshi (千頭星山トレッキング) is one of the popular hiking around Tokyo. It will climb up Mt. Amari and Mt. Sentoboshi that are located in Nirasaki, Yamanashi Prefecture. It is about 4 hours round trip with beautiful forest and view of Kofu Basin and Mt. Fujire. In May, it has a beautiful Azalea flowers. Use Route 20 to 613 west. Entitled: the 100 best Yamanashi mountains. Level: the beginners to the intermediate people. Mt. Amari and Mt. Sentoboshi are very popular hiking spots in Yamanashi. Mt. Amari is one of the 100 best mountains of Yamanashi located in Nirasaki city. 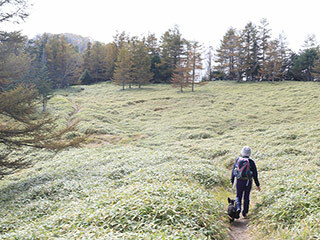 It is very an easy mountain for hiking. There are beautiful Azalea spots that bloom in May. Mt. Sentoboshi is 2,139m montain located in Yamanashi Prefecture. It has a great forest and excellent view of Yamanashi Bashin including Mt. Fuji. The hiking route is very easy, but it has sleep trail. In the forest, there are over old Japanese Larch, Fir and Tsuga diversifolia. Also, mountain flowers are so beautiful here. Mt. Amari - 30 min. Mt. Okuamari - 30 min. Mt. Sentoboshi - 1 hr. back to the parking 1 hr. 30min.